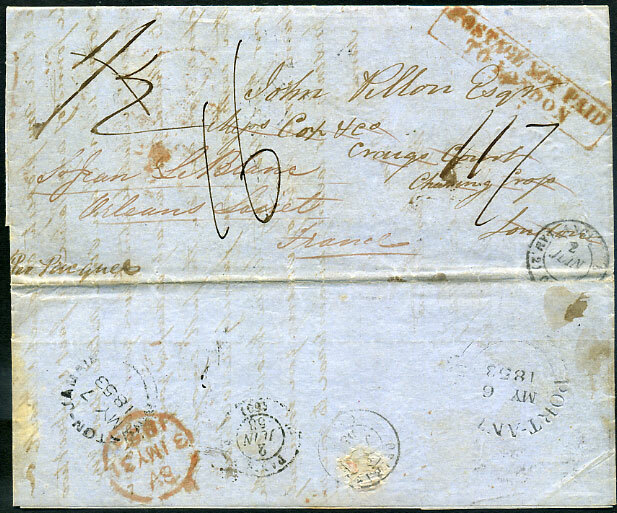 1853 entire to Orleans, France re-directed to Charing Cross, London rated 1/2 with framed red "POSTAGE NOT PAID/TO LONDON" despatched with PORT-ANTONIO dbl-arc (P3) dated MY 6 1853. Lengthy content from John Richards describing the discovery of "copper well interspersed with silver" found on one of his properties and "strong indications of Black Lead" on another. The letter goes on to describe the boom in mining and exploration - "The Parish of Portland seems to be one vast lump of mineral worth, every day brings a new discovery"